Take the GRE. Most programs will require your GRE scores. You’ll want to do this early, in case you need to take it again. You can and should study for the GRE – no matter what people tell you, studying affects scores. Why is a good GRE so important? It is not only about getting admitted. GRE scores are often used in allocating fellowships, RAs, and TAs. A bonus fellowship could mean as much as a 30% increase in your funding offer. Select at least 3 people to write letters of reference on your behalf. They should be faculty who know you well and can speak about your ability to succeed in graduate school. Do not include letter writers such as family, friends, pastors, or other “character references.” They hold little to no weight and may count against you if the review committee assumes you couldn’t find academic references. When selecting letter writers, ask them if they can write, “a positive recommendation” instead of just “a recommendation.” You want an honest answer. A recommendation from a class instructor that just says “This person was in my class. They seemed interested. They received X grade” doesn’t mean much to the review committee. You should alert letter-writers ahead of the first deadline, at least a month preferably two. Even for professors you know well, it never hurts to remind them of all the research activities you’ve had and what you learned from them. A page with a bulleted list will help jog the memory of your letter writer to help them write a detailed and personal letter. You’ll probably hear in February about acceptance, but it may be as late as the end of March. If you were put on a waitlist, you might not know until just before the April 15th deadline. This is because schools may have put out offers and are waiting to hear if they are accepted before making an offer to you. There is no shame in coming from the waitlist – even the waitlists are very competitive for PhD programs. 3. Be succinct! Omit needless words. Bad: your vs you’re, any misspelled words, and so on. 7. Avoid carelessness: Sending an email to Dr. A but writing your emails addressed to Dr. B. Below is a sample “approach email” to the professor you are considering as an advisor. Yours will differ, but this is an example of the level of formality and what to include. I am a senior psychology major at My University and interested in pursuing a Ph.D. in Human Factors Psychology after graduation. I came across your research when I was collecting articles for a literature review on user trust in automated systems and am interested in applying to your lab to work on similar topics. In the past two years, I have worked as a research assistant in a lab here at My University and spent a summer in an NSF REU program at Bigger University. In the MU1 lab, I worked with Dr. So Andso on research into motivation changes across the lifespan. I learned to enter and clean data for analysis with SPSS and SAS, follow a research protocol to run participants, and write SPSS syntax. One specific project I worked on was investigating whether people over 65 reported different motivations for performance and whether they responded differently than younger adults to reinforcement schedules on an implicit learning task. This gave me an interest in aging but more generally an interest in individual differences. I am excited by the prospect of continuing in a research program after graduation and believe I would be a good fit for your lab. Please let me know if you will be accepting applications this year. The optimal time for sending this email is the fall semester of your senior year. This gives you time to communicate, perhaps plan a visit, and let the faculty member know you’ll be applying to their program. In this post, we discuss a general to-do list for those considering graduate school in Human Factors. Comments from other faculty welcome! This can be through a senior project, a class at your university where students do a research project, or (optimally) by working as a research assistant in a lab. If your university does not have these opportunities, look around (nearby universities). Many professors will take volunteer research assistants, including in the summer, and train you in their lab. This gives you both experience and a potential reference letter. Many programs or labs have information on their alumni. Do they have the kinds of jobs you want? Do their alumni work at places you would like to work? You will work mainly with a single advisor in an apprenticeship model. However, it’s a good idea to consider programs where you match more than one professor. Check out the research interests of potential advisors by reading some of their recent publications or look at their curriculum vitae (the academic term for resume; often found online). We often have an area of expertise but work in other areas as well. You don’t want to choose an advisor based on work from 20 years ago that isn’t being continued today. It is highly unlikely that a potential advisor will initiate a new research area to fit your interests–be flexible in your interests. Create a spreadsheet listing department, contact information/web address to apply, potential faculty (and their major research areas), application fee, deadline, required materials, and your rating of fit. When you have identified some potential programs, check their website to see which faculty are affiliated with the program and taking students. Not all faculty take students every year. Some faculty list on their website whether they are taking students. If unsure, a short, formal email to the professor asking if they are accepting new students is appropriate. Just because they are on a departmental website does not mean that they are affiliated with the HF program (that department may have other graduate programs) or that they are taking students that year. If it is unclear, email and ask. It isn’t helpful if, for example, you are applying to a psychology program but list an industrial engineering professor as your preferred mentor. If you would like to evaluate potential fit between you and your potential mentor, you can ask if they are willing to meet with you in-person. Opinions vary, but Skype/video conference meetings may work. Our next post will give an example of the kind of formality expected in contacting a prospective advisor. Those who know me know I am a fiend for podcasts. Since I’m also a fiend for psychology, I can’t help but notice when it pops up in a podcast, even one not focused on psychology. I use many of them in my courses: for example, the This American Life episode on what having schizophrenia sounds like is a must listen when I hit the Abnormal Psychology chapter in Intro. The Radiolab Memory and Forgetting is a staple in my Cognitive class and I take advantage of the multi-disciplinarity of Human Factors to play clips from every area. Startup had a good one that illustrates what human factors looks like to a client. Over the years I’ve compiled a list of my favorites relating to psychology. Some are clips from longer podcasts while some are dedicated to psychology (e.g., Invisibilia). Each one has a general area of psychology noted (although some hit two or more areas) and if it’s a clip I put the start and end time of the most related audio. I hope you enjoy the resource and I will keep updating it as I find more. If you know of any I don’t have listed, please link to it in the comments for the blog and I’ll add it to the spreadsheet. Here is something fun to play with today: a tool that visualizes the occurance of words in RateMyProfessor reviews according to the gender of the professor and the department he or she teaches in. Data comes from over a million reviews at RateMyProfessors.com. My previous posts on using the iPad have become some of the most popular posts on this blog. So I thought I would give you an update on my evolving use of the iPad. My history of use of the iPad started with great skepticism, moved into curious and active experimentation, and has settled into routine usage. Now, it’s an integrated part of my work and play. I’ve even done what was once unthinkable: nearly wrote a entire manuscript on the iPad without a hardware keyboard! (read on). With great skepticism I got the original iPad a few months after it was released in 2010. While I could see the theoretical benefits of such a lightweight device, there was not yet much software that was specialized to do any work. In terms of usage, there were probably days that I did not use the iPad. It was primarily relegated to recreational web surfing or curious novelty. After the release of the iPad 2, however, my usage increased dramatically. The reduction in weight and size, as well as the release of high quality productivity software meant that I not only carried it along with my then-laptop (Fujitsu P1620 ultraportable tablet), I could start to envision how I might start replacing my laptop. Usage was probably split 20 (iPad)/80 (laptop) in terms of mobile computing. It also helped that it was at this time that I switched my desktop computer and laptop to Mac. This made it much more seamless to use Keynote and Pages as replacements for Powerpoint and Word. I’ve kicked Powerpoint but I can’t yet kick Word to the curb. The iPad 3 again increased usage mainly because of the high resolution display and dramatic speed increase made everything better, especially reading PDFs. Now, I have an iPad mini and all the software that I’ve mentioned in previous posts are still usable but the form factor has now truly made it even more my primary mobile device of choice over the laptop. The effects of an always-on, super-ultra lightweight device seems to encourage frequent use in places where even a laptop is clunky (e.g., in bed, passenger in a car). I’m currently working on a manuscript and I would estimate that I’ve written more than 50% of it on the iPad mini (using the software keyboard and Pages). Probably another 10% on the iPhone (reading what I wrote, light editing) and the rest on the desktop or laptop computer. Keynote is an especially capable presentation app. I’ve worked on full presentations created on the iPad (but presented on a laptop). They are whisked silently through the cloud and are on my laptop/desktop waiting for me. But there are other things that are making the iPad work especially well for me. One feature that isn’t discussed a great deal in reviews is iCloud. iCloud, in contrast to Dropbox, invisibly keeps my Keynote (class lectures, professional presentations) and Pages (manuscripts) in sync on all my devices (desktop, laptop, iPad mini, and iPhone). I still use Dropbox but iCloud is simpler model with less thinking about spatial file organization (the file is just in the app). I still use Dropbox but treat it like an archive; a folder with many levels of folders. While I treat iCloud as an active area for current work, a work space. iCloud = short term memory, dropbox = long term memory. This setup works quite well for me. Uses will be different for different people but for me (someone who values portability above all else and is a tinkerer) the Mini is a winner (it replaced my iPad 3). I also did not set unrealistic expectations of the device which may be why I’m so surprised how much of my daily computing can be addressed with such a relatively low-powered device. The size/weight of the Mini simply overwhelms any other benefit of the larger iPads. When I travel, I am now more likely to be carrying just the iPad (with no laptop unless I know i’ll need to program or do statistical analysis). In the end, it allows me to do a small amount of things in more places than at my desk. Keynote and Papers are truly exceptional apps that have nearly the full functionality of their desktop counterparts without replicating the same interaction style (i.e., they are optimized for tablets). I actually prefer doing lit searches in the iOS version of papers than using the desktop version! This list is short because everything else is for fun! We’ve posted before on usability evaluations of iPads and apps for academics (e.g.,here, and here), but today I’d like to point to a blog dedicated to evaluating apps for mental health professionals. 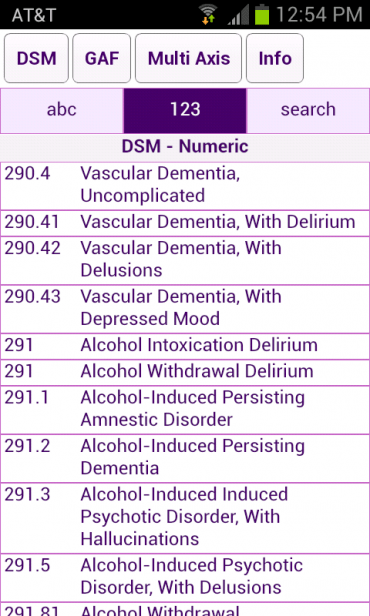 In the newest post, Dr. Jeff Lawley discusses the usability of a DSM Reference app from Kitty CAT Psych. For those who didn’t take intro psych in college, the DSM is the Diagnostic and Statistical Manual, which classifies symptoms into disorders. It’s interesting to read an expert take on this app – he considers attributes I would not have thought of, such as whether the app retains information (privacy issues). As Dr. Lawley notes on his “about” page, there are few apps designed for mental health professionals and even fewer evaluations of these apps. Hopefully his blog can fill that niche and inspire designers to create more mobile tools for these professionals.